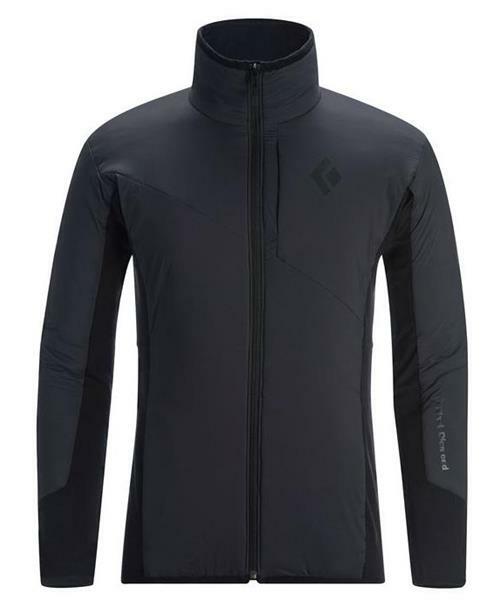 Drawing elements from time-tested fabrics and materials to create a new breed of technical insulating midlayer, the Black Diamond Deployment Hybrid Jacket offers an extended comfort range across the spectrum of seasons, conditions and mountain pursuits. By strategically combining ultralight Schoeller® softshell fabric and PrimaLoft® Silver Hi-Loft insulation in the body and sleeves, with our merino-blend Deployment fabric under the arms and on the back, the Deployment Hybrid strikes a functional balance between insulation and breathability that eliminates unnecessary layering adjustments throughout the day. An integrated mesh lining helps manage moisture on steep approaches, crux pitches and technical descents, while a zippered chest pocket and zippered hand pockets ride above your harness and store small essentials.